Ashburton's reaction to the Peterloo massacre. On the 16th August 1819 the local Yeomanry, backed by Hussars, charged at a peaceful crowd who had gathered in what is now St. Peter's Square, Manchester. Their task was to arrest the speakers, who were protesting against poverty and advocating democracy, but the violent over-reaction of the troops resulted in 18 deaths and over 700 people being seriously injured. It became known as the Peterloo Massacre. Richard Carlile, who was born in Ashburton, was scheduled to speak at the gathering. He escaped and later published his eye-witness account, together with the print above. See Famous Ashburtonians for more on Richard Carlile. Andrew G C Tucker, a lawyer from Ashburton, gave his opinion on what had happened. He said that the meeting was legally convened, for legal purposes, and that a warrant against Hunt (Henry Hunt, a radical speaker) was 'unduly obtained and unjustifiably executed'. That an armed soldier should execute this warrant was, according to Mr Tucker, illegal, and that 'if the assault by the military was unprovoked, it was contrary to law'. He added that any attempt to suppress peaceable meetings was 'a breach of the fundamental privileges of Englishmen'. It was 'treason against the Constitution'. In December of that year Ashburton residents sent a message to the Prince Regent assuring him of their loyalty to the crown, but not declaring an opinion on the incident until a 'full and fair investigation' had been made. In 1827 various 'valuable property' was for sale at the Golden Lion. In 1828 five cottages had just been built at Crokaton, and were for sale by auction. They had gardens in front and an orchard at the end, and were currently occupied by Mr Philp, Mr Ellis, Mr Popplestone, Mr Standbury, Mr Woodley and others. With the property came an entitlement to vote for the Ashburton members of parliament. A tenement called Reeves in North Street was up for sale in 1831. A house occupied by Mr Tuckerman was part of the sale, as was a public bakehouse in Reeves Court, behind the house, occupied by Joseph Berry. 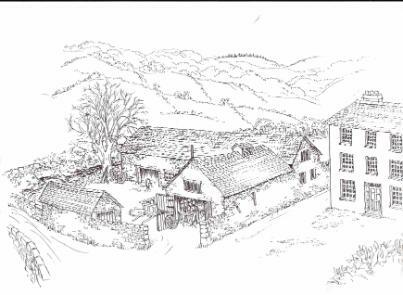 Two tenements adjoining the bakehouse were included - they were occupied by William Foale - as was a house, garden, stable and orchard on Back Lane behind the tenement. George Mortimore and others occupied these premises. Purchase of the whole came with two votes for members of the borough. 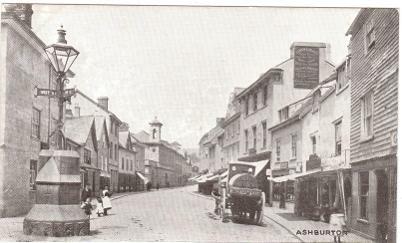 The auction was to held at the Duke's Inn; the solicitors were Abraham and Kitson, Ashburton or Torquay. 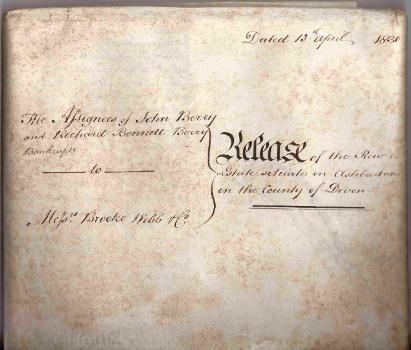 Above: Release of the Rew Estate, dated 13th April 1830. The Assignees of John Berry and Richard Bennett Berry, bankrupts, to Messrs Brooke Webb and Co. 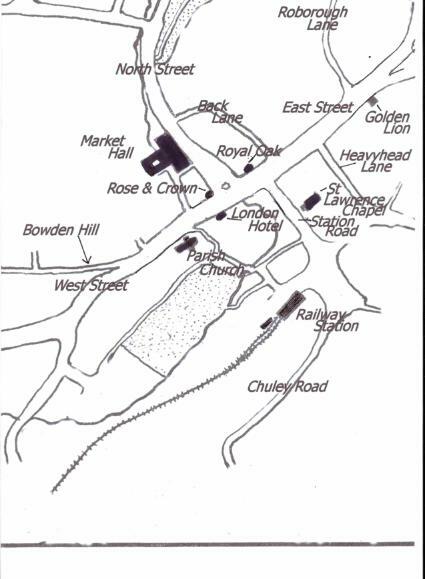 Right: Map of the Rew Estate. The road 'From Ashburton (bottom quarter of the map) goes to 'Belford Factory'. At the crossroads the road goes left up to present day Druid. Until 1858 wills were proved in various church courts - where exactly depended on both the location of the properties and goods, where the person died and the value of the estate. The highest court for the south of England was the Prerogative Court of the Archbishop of Canterbury - hence PCC wills. http://www.nationalarchvies.gov.uk/ You can find full references on the website, and order copies online. Alternatively you can visit the archives and view the wills for free. Apparently William does at least write more than Charles – Sarah thinks he may be sorry for it in the end. Charles is probably another son – in August 1821 Charles John Honywill was baptised, the son of William Ferris Honywill and Sarah. The same parents baptised a son William Henry Honywill in May 1819. William Ferris Honywill married Sarah Scagell in Ashburton in 1818. Peter had been in a bad state of health having fallen from a horse two years previously, and had died, a Mrs Eliot witnessing his last moments. Ann Buchers of Holne had also died, a sister to Jo Bowden's wife. Charles Baker, a carpenter had died, as had John Saunders, 'haredresser.' (Both of these are probably those deaths registered in the June quarter of 1856, Newton Abbot district). One of these was 'Susan's unkle' but it is not clear which. She asks William if he has seen John Honeywill's second son, as his brother sent for him. 'Harrises' family all went to America, as did nurse Eals. 'Yong wood' has been down from London and will stay if there is work. He has done up his mother's house. Sarah Bowden the tailor's daughter got married and has got one child. 'Mrs Legs Nises husband' is 'very poor'. Presumably this is Mrs Leg's (or Legg's) niece's husband. Finally she asks whether there is likely to be 'ware' (war) in America, as reports say. This suggests that William is in America. From a letter sold privately – not in my possession. 804 - Higher Headborough house and garden etc. 1532 and 1533 - Dwelling house and garden in East Street, occupied by Mrs Chalker. 1357 - Three dwelling houses and garden in East Street, close to Derrick's Lane, occupied by Mssrs Richards, Caunter and Dodridge. 1346 - Dwelling house and coach house with garden at rear, East Street. Occupied by Mr Yeldham. 1231 - Dwelling house in West Street, occupied by Elisha Smerdon. In June 1867 Mabel Gwendoline Hughes was baptised at St Andrew's Church. Her parents were James Victor Hughes, a Major General in the army, and his wife Elizabeth Maude. The family lived at the Knoll. 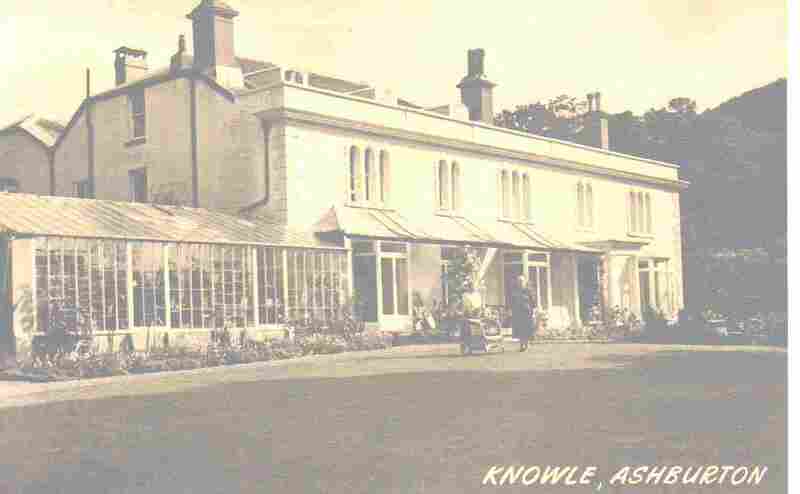 Mr E Sawdye was selling furniture at the Knoll in March 1871, and a month later the house was up for let at £60. Set in an acre and 'lately occupied by General Hughes', the house had breakfast, dining and drawing rooms, a kitchen with pantry, scullery and larder, and 8 bedrooms. There was also a coach-house, stables and other outbuildings. 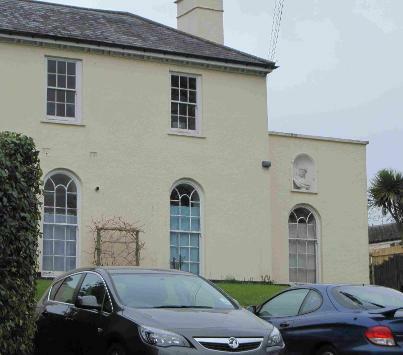 F Crowdy was living at the Knoll in 1872 - in June his wife gave birth to a daughter in Torquay. A year later the house was being let again. In 1876 a 'Fancy sale' was being held to pay off the debt of Widecombe Church. The sale was being held at the Knoll, by permission of J Robinson Esq. An omnibus from the town would take visitors to the Knoll from the town or the railway station for 6d, and it would cost 1s to get into the sale. Tea and coffee would be available from 4 o'clock, and there were to be games on the lawn. By 1880 Mrs H M Firth was advertising for a housemaid and parlourmaid at the Knoll, to work for a small family. 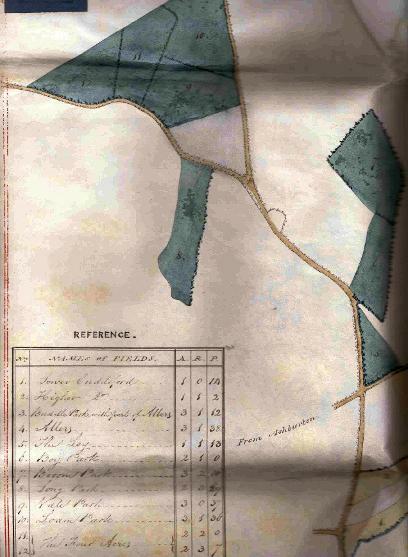 Henry Mallaby Firth and family are at the Knoll in the 1891 census, although they are already calling it Knowle. A letter addressed to H M Firth in 1894 calls the house Knowle. See Attorneys, under Banks and Businesses, for more information. Some residents ('Head of house') of West Street in the 1891 census. It begins with The Vicarage and comes down the street on what is now the odd-numbered houses, ie the south side of the street. Edward Matthews, Publican licensed victualler - Duke's Head. West Street in 1891 census, now = No. 2 East Street. Residents of West Street in the 1891 census in what is now even-numbered houses, ie the north side of the street. There is a group of properties that begins this list that come before Bowden Hill - I assume that these are also on the north side of the street, at the very top, coming down. Above: Stone bridge over the River Ashburn, sometimes called the Yeo, at the top of North Street. 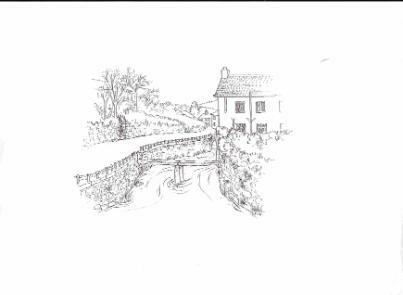 My thanks to Peggy Wakeham and Robert Wakeham for the above drawings. Some residents ('Head of house') of North Street in the 1891 census. It begins at the top of North St. and comes down the street on what is now the odd-numbered houses, ie the west side of the street. I have included occupations where it seems likely (to me) that the occupants were operating businesses from the premises. Some residents ('Head of house') of North Street in the 1891 census. It begins the furthest away from the Bullring and then comes down the street on what is now the even-numbered houses, ie the east side of the street. I have included occupations where it seems likely (to me) that the occupants were operating businesses from the premises. * The Western Times reported in 1890 that old buildings in North Street -Tudor Buildings - had been demolished and and new buildings put up in their place. Some residents ('Head of house') of East Street in the 1891 census. It begins the furthest away from the Bullring and then comes down the street on what is now the odd-numbered houses, ie the north side of the street. Some residents ('Head of house') of East Street in the 1891 census. It begins the furthest away from the Bullring and then comes down the street on what is now the even-numbered houses, ie the south side of the street. Then comes Heavyhead Lane, now Woodland Road. But it seems likely to me that the properties above come down to the Bullring - in the 20th century Henry Bradford had a printing works with huge machines at 12 East Street. I would think that Lavington B Varder was also at those premises. Some residents ('Head of house') of St Lawrence Lane in the 1891 census. It comes down the street on what is now the odd-numbered houses, ie the east side of the street. Some residents ('Head of house') of St Lawrence Lane in the 1891 census. It comes down the street on what is now the even-numbered houses, ie the west side of the street, and starts immediately after Hazeldene, Chuley Road. 1881 The first Cottage Garden and Allotment Society show was held in a field known as Greylands. Owned by Henry Tozer, the field was near the Board Schools. In the 1901 census Charles Fisher Hawken was a butler and boarding house keeper in East Street, working on his own account. 1901 Sawdye and Son were selling household furniture and poultry at Greylands. Mr C Hawken, who was leaving the premises, had given instructions for the sale. The Rev H B Tillbrook was leaving the neighbourhood in 1908. Consequently furniture, books and outdoor effects were being sold at Greylands on the 9th March. By January 1922 Greylands was a private hotel. It had a garage and 'every comfort', offering 'excellent cuisine' using produce from its own garden. See Greylands and the Wilderness Schools for more information on Greylands as a school. See extracts of later dates in the 1900s section - it is possible that the first Inland Revenue application is also from a later date, particularly as some properties are numbered. Inland Revenue. Application for a certificate under section II of the Finance Act 1894. Freehold shop and dwelling house No 17 East St.
Cottage adjoining situate in Back Lane. 10th June 1892. By his will of this date the said Alfred Merchant Harvey gave, devised and bequeathed all his real and personal estate of every description to his wife Lydia Harvey.